14 | November | 2014 | SHANNARO!!! One Piece Manga Chapter 767: Nooo! Corason! Hey Guys, This is White Shinobi. I’ll be doing this week’s One Piece review. Some of you might remember me, I used to make fanfics and Fairy Tail reviews on here a long time ago. In case anyone wants to know what happened. My PC crashed and I lost everything I was working on at the time, this made me lose all motivation to write things and at the same time life was getting a little busy for me too so I decided to just lurk around instead of actively participating. Anyway, I’m rambling enough about me, on to the reason why you’ve all come here, the One Piece review. The chapter starts with a young Doflamingo killing his own father because the spoiled brat wants to get back his nobility title. We also see a young Vergo and Trebol encouraging him. His father apologizes to his sons as he’s shot into the head. 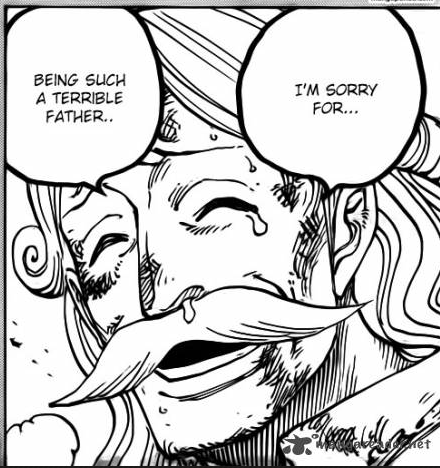 I really feel sorry for the man, he had the best intentions, he didn’t want his children to turn into slave-driver like the other Tenryuubito too bad Doflamingo already was too much of a spoiled brat to appreciate his father’s effort. We get back to Law’s flashback where Doflamingo has used his birdcage on the island and has the pirates slaughter each other. A boy named Dory escapes from the cage and leaves his crewmates alone to die against Doflamingo. Corason and Law have managed to escape from Vergo and Corason hides Law in a chest, he’s used his devil fruit ability to make sure Law won’t be heard no matter how much sound he creates. Corason gets caught by the Doflamingo crew. When facing his brother he makes a bluff claiming that law has already escaped the birdcage, luckily the marines have a boy in custody which makes me think that Dory made it out to the marines. Doflamingo shoots Corason and moves with his crew including Law hiding in a treasure chest back to the ship. Law manages to escape as soon as the pirates leave to search for him. Doflamingo notices that the marine ship belongs to Otsuru, this really makes me wonder how strong she is. Everyone seems to hold at least a certain amount of respect or fear towards her. 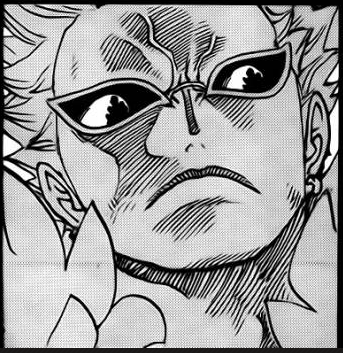 Even Doflamingo looks a little more pissed than before. As the snow starts to cover Corason’s dying body the marines start firing their cannons. And the chapter ends with law crying as Corason dies, luckily the cannon impacts at the same time as Corason dies and Law is still safe. But will he be able to stay safe? The Doflamingo pirates are near him and may be able to spot him at any time. Well I guess that’s it for this week, I’m pretty sure you guys will let me know what I’ve missed. Let me know if you want more reviews, I know I’m not the best person to do this but I’ll try my best.